Smooth grooves, funky jazz, jazzy funk and party vibes! 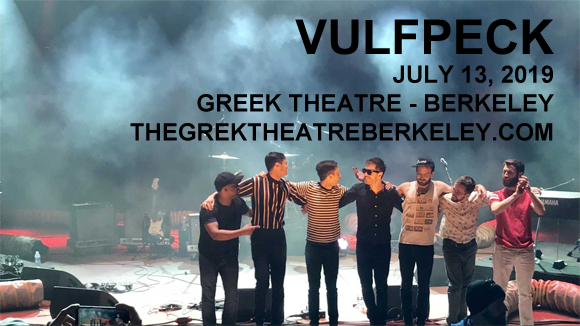 Vulfpeck is headed to Greek Theatre Berkeley on Saturday 13th July 2019 to blow your minds with their next-level talent! A group of virtuoso multi-instrumentalist performers with buckets of soul and an endearing sense of humor (two essentials for any amazing live band), Vulpeck are nothing short of breathtaking on stage! This will be a captivating and unforgettable show! Formed by Jack Stratton (keyboards, drums and guitar), Theo Katzman (guitar, drums and vocals), Woody Goss (keyboards), and Joe Dart (bass) in 2011 at University of Michigan's music school in Ann Arbor, Michegan, Vulfpeck is an American funk band. The group made headlines with the release of Sleepify, a ten-track silent album on Spotify, which raised $20,000 in royalties over a two-month period to fund an admission-free tour for the band. After the international press coverage they received, the band gained more public recognition, and their 2015 album Thrill of the Arts debuted at number 16 on the U.S. R&B Albums chart. Their 2016 album The Beautiful Game did similarly well, debuting at number 10. The group's latest release is Hill Climber (2018), which features Cory Wong, Joey Dosik, Antwaun Stanley, Mike Viola, Monica Martin, and Louis Cole.